Garden lilies are perennial flowers, but they also need transplant to the flowerbed adorned the street, and the plants continued to please their owners annual lush bloom. 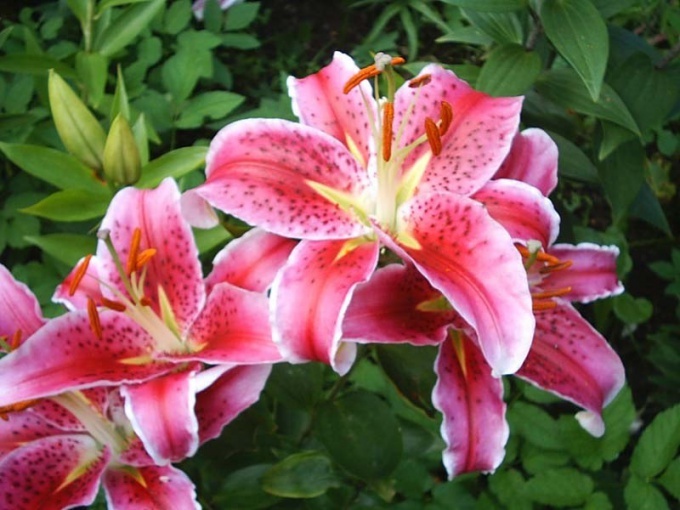 Lily to feel well and bloomed profusely every year, you need to replant them every 3-4 years. This rule does not apply to all grades. To clarify the requirements of specific varieties, it is necessary to study its characteristics. Autumn is preferable to transplant lilies, after they entered into a state of peace. However, in some situations a valid and spring planting bulbs. In this case, the grower risks losing flowering lilies this year, but at the same time decreases the risk of freezing, the fresh plantings in the winter. Over the summer the bulbs are well rooted and will enter the winter strong. Generally, spring planting lilies produced from bulbs purchased in flower shops. If planting material is necessary to preserve the fall, you should treat this process responsibly. The best place to store onions – the bottom shelf of the refrigerator in a perforated plastic bag, interspersed with wet sawdust. Spring planting should be done in a prepared and filled with the autumn sun warmed the soil. This time is at the end of April-beginning of may, depending on the region. More whimsical when transplanting delicate lilies Oriental Hybrids, Asiatic Hybrids that can be transplanted at any time because they do not suffer from direct. It is possible to transplant them before and after flowering, provided the basic rules of planting. - depth of planting will depend on the size of the bulbs: large bulbs should be planted at 20 cm, 10-15 cm, measured from the bottoms of the bulbs. After the appearance of the sprouts should start to feed the transplanted lilies once a month, using the mineral phosphorus-potassium fertilizer. From fungal diseases need twice a season to handle landing with a solution of copper sulphate or Bordeaux mixture. Planted in warm soil in spring the bulbs are sometimes overtaken in the development of their counterparts planted in the fall.